Which of these insects is a preying mantis and which is a mantispid? A small mantispid and a preying mantis, an example of convergent evolution. Sometimes evolutionary change follows a common pathway in two or more unrelated or distantly-related organisms because of similar environmental pressures. It culminates in unrelated organisms with similar morphological characteristics even though they did not have a common ancestor. This phenomenon is called parallel evolution. There are many examples of parallel evolution in plants, including distantly-related plant families that have evolved from an autotrophic to a parasitic mode of existence. Some plants have evolved independently into a mycotrophic mode of existence where they obtain nutrients from mycorrhizal soil fungi, which in turn, are parasitic on the roots of nearby forest trees and shrubs. Photosynthetic pathways, such as CAM (crassulacean acid metabolism) and C-4 photosynthesis, have also evolved independently in distantly-related plant families. Another example of parallel evolution is the appearance of xylem vessels in the vascular tissues of very distantly-related plants, such as Ephedra in the gymnospermous division Gnetophyta and flowering plants in the angiospermous division Anthophyta (Magnoliophyta). In addition, species of Ephedra have double fertilization, where two sperm are involved in the fertilization process. Double fertilization was once thought to be a strictly angiosperm characteristic. Some older references have suggested that the Gnetophyta may represent a "missing link" in the evolution of flowering plants, but others say that vessels and double fertilization are examples of parallel evolution, and the Gnetophyta are more closely related to conifers than angiosperms. The current consensus among authorities (as of 2010) is that Amborella trichopoda (a primitive angiosperm without vessels) and all other flowering plants represent sister clades derived from an common ancester without vessels. This latter conclusion supports the independent (parallel) evolution of vessels in the Gnetophyta. Cladograms showing four different hypotheses for the monophyletic origin of flowering plants. Although there are different hypotheses for the monophyletc origin of flowering plants (angiosperms), vessels appear in two distantly related groups: the Gnetopytes and Angiosperms. This is an example of parallel evolution (Homoplasy). When parallel evolution under similar environmental conditions in distantly-related organisms results in plants and animals that are morphologically very similar in overall appearance, this is called convergent evolution. It should be noted here that some authors use these two terms interchangeably. North American cactuses (family Cactaceae) and South African euphorbias (family Euphorbiaceae) belong to different plant families and are distant relatives in the phylogeny of flowering plants; however, they both have succulent, thick stems that store water, they both have spines for protection, and the both are adapted for survival in arid desert regions with low rainfall. Without flowers, some African euphorbias are practically indistinguishable from their North American counterparts. 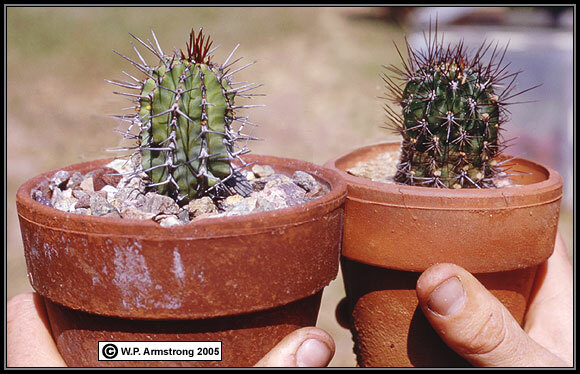 Which of these xerophytes is a cactus and which one is a euphorbia? Why Differentiate Parallel From Convergent Evolution? "Biologists often distinguish 'convergent' from 'parallel' evolution. This distinction usually assumes that when a given phenotype evolves, the underlying genetic mechanisms are different in distantly related species (convergent) but similar in closely related species (parallel). However, several examples show that the same phenotype might evolve among populations within a species by changes in different genes. Conversely, similar phenotypes might evolve in distantly related species by changes in the same gene. We thus argue that the distinction between 'convergent' and 'parallel' evolution is a false dichotomy, at best representing ends of a continuum. We can simplify our vocabulary; all instances of the independent evolution of a given phenotype can be described with a single term - convergent." "If the use of the terms 'parallelism' and 'convergence' cannot be associated with a clear dichotomy, either at a phylogenetic level or a molecular level, then their continued use is not justified and can even be misleading. They are relics of a time when we could not evaluate the underlying causes of phenotypic similarity and were confined to inferences based on comparative anatomy. These terms are also relics of a time when there was not an appreciation of the complexity of genetic and developmental networks that underlie the determination of simple phenotypic traits, such as coloration. We argue that this might be a good time to simplify our vocabulary. We need only one term to describe the independent evolution of phenotypic similarity. 'Convergent evolution' will do nicely." In Australia there are many examples of marsupials that resemble our North American placental mammals. For example, Australia's flying phalanger is remarkably similar to the North American flying squirrel. Both tree-dwelling mammals glide through the air with their parachute-like fold of furry skin between the front and hind legs. Another example of convergent evolution is the North American preying mantis and the mantispid. Although they differ greatly in size, these two insects are remarkably similar in appearance. They both have triangular heads with large eyes and a pair of raptorial (grasping) front legs. Their other two pairs of legs are used for walking. They belong to two very different insect orders. Mantids belong to the grasshopper order Orthoptera, along with crickets and cockroaches. Mantispids belong to the order Neuroptera, along with lacewings, snakeflies and antlions. The mantispid is much smaller than the preying mantis and has shorter antennae. Mantispids have two pairs of membranous wings with a network of veins (nerves) typical of the order Neuroptera. In fact, the name "Neuroptera" is derived from Greek and means "nerve wing." The wings are held tentlike over the body, unlike the wings of mantids. Mantids have a pair of leathery forewings that lie flat over the abdomen, a typical arrangement of the grasshopper order Orthoptera. A pair of membranous hind wings are folded beneath the forewings. Mantispids undergo complete metamorphosis with an egg, larva, pupa and adult. Mantids have incomplete metamorphosis with a egg, nymph (that resembles a miniature adult) and adult. A female mantispid will lay numerous stalked eggs on leaves and wooden structures. The newly hatched larvae, less than a millimeter in length, begin their genetically-programmed search for spiders. They enter the egg sac of a spider, either through direct penetration, or they climb onto the female spider and enter the egg sac as she builds it. While the matispid is waiting for the female spider to build an egg sac, it will enter the spider's book lungs and feed on the spider's blood. The mantispid enters the egg sac before the female spider can finish spinning the protective silken case. Once inside the egg sac, the mantispid will dine on spider eggs and grow. The mature larva will then spin a cocoon and metamorphose into a pupa, all of this within the spider's egg sac. It will emerge as an adult a few weeks later. Homology: Similarity Of Characteristics Due To Origin From A Common Ancestor. I prefer to use the terms homology and homoplasy when dicussing the evolution of similar characteristics. Homology refers to similarity due to a common ancestor. Characteristics derived from a common ancestor are termed homologous. Homologous organs are similar in structure and embryonic origin but are not necessarily similar in function. Cactus spines are homologous to bud scales of an axillary bud. Seed-bearing carpels of flowering plants are homologous to leaves because of their similarity in form, anatomy and development. The bone structure in the wings of a bat is homologous to the forelimbs of humans and other mammals. For example, a bat's wing and whale's flipper both originated from the forelimbs of early mammalian ancestors, but they have undergone different evolutionary modification to perform radically different tasks of flying and swimming. The presence of homology is evidence that organisms are related. Homoplasy (ho-MOP-la-see) means similarity due to independent origin that is not from a common ancestor. Using the term homoplasy avoids the confusing distinction between parallel and convergent evolution. Homoplastic characteristics, such as the spines of cacti and stem-succulent euphorbias, evolved independently from each other. Cactus spines arise from an axillary growth center called an areole. Euphorbia spines are derived from modified stipules. Homoplasy includes parallel and convergent evolution. Similarity of appearance in unrelated or distantly-related organisms is often the result of similar evolutionary pathways under similar environmental conditions. For example, the wings of birds and insects are used for flight. They are analogous but not homologous because their structure, embryonic development and genetics is very different. In addition, they do not have a common ancestral origin at the beginning of their evolutionary development. Sometimes it is unclear whether similarities in structure in different organisms are analogous or homologous. For example, the wings of birds and bats are homologous in that they are both modifications of the forelimb bone structure of early reptiles. However, bird's wings differ from those of bats in the number of digits and in having feathers for flight while bats have no feathers. Bat wings involve the bones that in humans make up the hands, while bird wings lack many of these bones entirely, and instead include only the bones that in humans make up the arms. In addition, the power of flight arose independently in these two very different classes of vertebrates. The two lineages had a long evolutionary separation before they independently became fliers. Wings in birds evolved from early reptiles, and in bats they evolved after their mammalian ancestors had already completely differentiated from reptiles. Thus, the wings of birds and bats can be viewed as analogous rather than homologous upon a more rigorous scrutiny of their morphological differences and evolutionary origins. Homoplasy is a characteristic shared by members of a phylogenetic tree (cladogram), but not present in their nearest common ancestor. It arises independently by convergent evolution in more than one clade. For example, both mammals and birds are able to maintain a high constant body temperature (warm-blooded). However, the ancestors of each group did not share this character, so it must have evolved independently. Mammals and birds should not be grouped together on the basis of whether they are warm-blooded. The recently discovered cerambycid beetle Onychocerus albitarsis in Peru is truly one of the most remarkable examples of convergent evolution (homoplasy). It is described by A. Berkov, N. Rodriguez and P. Centeno in Naturwissenschaften Vol. 95, March 2008. Venom-injecting structures have arisen independently in unrelated arthropods, including spiders, centipedes and antlions. The venom is injected through hollow fangs (poison jaws), or in the case of centipedes, through modified forelegs. Among insects only wasps, bees and ants of the order Hymenoptera are known to possess true stingers. Microscopic examination of the newly discovered beetle has revealed that the tip of each antenna is truly a stinging device. In fact, Mr. Centeno discovered this fact first hand. As he grabbed the beetle, the insect jerked back its antennae and pricked his finger, which swelled as if stung by a bee. This is the first example of a stinger in the enormous beetle order Coleoptera. A hypothetical cladogram showing the origin of a similar stinging device in two distantly related groups of arthropods that is not present in their nearest common ancestor. These stinging organs are not homologous. Although they are remarkably similar in appearance and function, they are structurally quite different. One is the modified terminal segment of a tail, and the other is from the terminal segment of a beetle antenna. 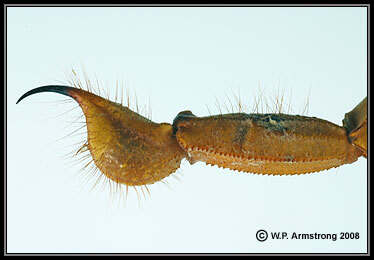 The terminal antennal segment of Onychocerus albitarsis has two pores opening into channels leading to the pointed tip through which the venom is delivered. The delivery system is almost identical to that found in the stinger of certain scorpions. Since beetles and scorpions belong to entirely different arthropod orders and are only distantly related, this is a dramatic example of homoplasy: similarity due to independent origin that is not from a common ancestor. In this case the homoplastic characteristics (stinging devices) evolved independently from each other. Although the article in Naturwissenschaften uses the term "convergent evolution," one might argue that this is "parallel evolution." The term homoplasy makes this confusing distinction unnecessary.